There’s a growing demand for drones that can fly safely outdoors. Some models can fly inside and outside. Most indoor drones are lightweight toy-grade craft. They’re usually tiny and can’t fly outside because of the wind. As a result, we have written this guide to help you find the best outdoor drones. HD camera, modular design, blade protectors, 360° stunts, flashing LEDs. 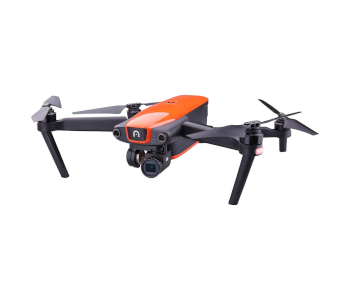 Easy to fly, quality gimbal camera, return to home, live view, mobile app. 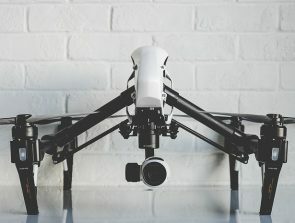 Foldable, long flight time, long range, ActiveTrack 2.0, 1080P video transmission. The main attraction of outdoor quads is aerial photography and videography. The cameras and filming features have gotten so much better in recent years, and prices have come down. However, there’s more to consider than just camera quality, hence this introduction. Some outdoor drones are easy to fly at any level. Others are more complex and need various skills to operate. Drone makers usually have a recommended minimum age for flying their products. Knowing your budget is the quickest way to narrow down the options. Note your needs and expectations too. For example, flying for fun only, aerial filming, drone racing, business, or leisure use? Feel free to add, delete, or modify the above list as it relates to you and your needs. A lot of drone pilots have lost their precious crafts to the dreaded outdoor flyaway. These events happen when the quadcopter loses its signal and flies away never to be seen again. Some models may lose power and drop out of the sky—lost forever. These events are less likely to happen with outdoor drones that have failsafe features. The most popular of these is Return to Home (RTH). The first two bring the drone back to base (you) if its battery gets low or the signal becomes weak. The third option is a simple button press that brings the craft back whenever the pilot feels the need. The eight picks in this guide look at some of the best outdoor drones available this year. The reviews mention any of the above features and characteristics a model has. Likewise, each piece also highlights any areas where a product falls short. You may need to compromise and break your list into needs (must-have), wants (would like), and realistic expectations. I chose these outdoor quadcopters based on extensive research. They are the result of personal thoughts, the opinions of industry experts, and feedback from real users. The first three on the page are Best Budget, Best Value, and the Top pick. The others are in price order, lowest to high. The Best Budget pick goes to the affordable Syma X5C-1 Explorers. 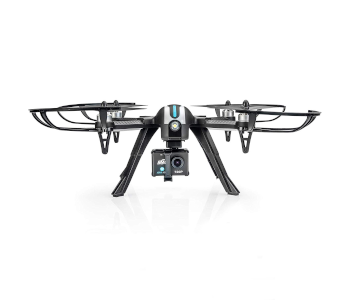 It’s an excellent choice for those new to the world of camera quadcopters and outdoor aerial filming. 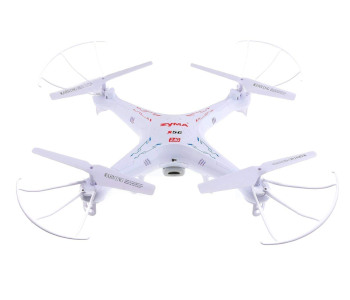 Syma’s X5C-1 is a superb beginner drone for nearby flying. The quad gives new users a real feel for piloting and filming on a budget. Its 12-megapixel HD camera only produces average footage, though. Still, the quality tends to exceed the expectations of most novice pilots for the price. The bright, colorful LEDs are a nice touch that let users fly in the dark. A built-in 6-axis gyro keeps the drone stable in the air on calm days. The elasticated blade guards help to protect the propellers and pilot’s fingers. A modular design makes maintenance and repairs super easy. And anyone who just wants the thrill of the flight can showoff with one-button 3D aerial stunts. Everything about this quadcopter is average although that’s expected at this price range. It also lacks some of the failsafe features found on costlier drones. The short 7 minute flight time and long charging time are other negatives. But the Syma X5C-1 Explorers offers exceptional value and is hard to beat for the price. Anyone with realistic expectations should find it a brilliant little training quadcopter. The Best Value outdoor drone is a favorite DJI camera quad called the Phantom 3 Standard. It’s easy to fly despite its sophistication, and the quality of the camera footage is striking. 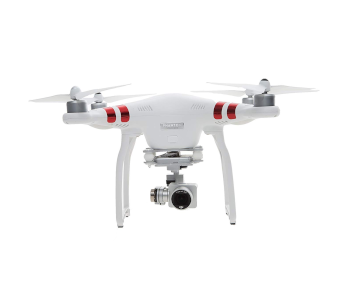 The Phantom 3 Standard is a stable outdoor camera quadcopter of outstanding value. Its dedicated controller has a smartphone clamp that gives users full fingertip controls. The quad has useful GPS assisted flight features that help to manage otherwise complex flying. That gives pilots more freedom to focus on shooting 12MP aerial stills and sharp 2.7K video. Pilots can see what the camera sees via the live video feed. The real-time feed shows on a regular mobile screen in 720P HD. 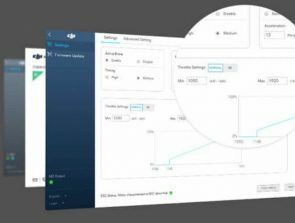 DJI’s intuitive flight app allows camera functions using tap controls. There’s also the Automatic Flight Assistant that returns the quad home (RTH) with a simple button press. DJI’s Phantom 3 Standard is not a small or easily portable quadcopter. That means its suitable only for flying missions. 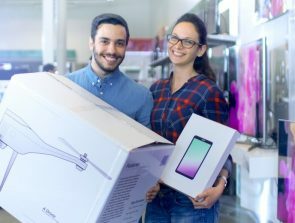 You can’t carry it around casually like some of DJI’s foldable camera quads. The other gripe is that the how-to vids are not beginner friendly. Yes, it’s an easy bird to fly, but newbies still need initial guidance. Don’t worry; YouTube is always there to make up for DJI’s poor instructions. The DJI Mavic 2 Zoom makes the Top Pick for this guide. It’s not cheap, but it is tremendous value. It’s an outdoor camera quad that excels in all areas and exceeds most aerial photographer’s expectations. This is the ultimate foldable, outdoor camera quad for anyone who needs to shoot like a professional. Smooth and stable footage is a given in all manner of situations. DJI’s 3-axis gimbal stabilization is first-rate. It provides steady cinematic quality video and detailed 12-megapixel stills. Best of all is the dynamic zoom perspectives. You can shoot from wide to mid-focal ranges and everything between. The Mavic 2 Zoom delivers video transmissions in 1080P up to a range of 8km. Editing and uploading aerial footage to social media in Full-HD is both quick and easy. The 31-minute flight time is also impressive. It lets pilots take on missions that go further and last longer than most other quads. And DJI’s new Active Track 2.0 (follow Me mode) is highly accurate even for high-speed tracking. Omnidirectional Obstacle Sensing is the Mavic 2’s incredible avoidance system. It can sense objects from all sides, i.e., left, right, up, down, forward, and back. The less the pilot needs to concentrate on flying, the more he or she gets to focus on aerial filming. And the super-resolution modes and Hyperlapse recording blow most fans away. This bird has so many features to explore and exploit. The Zoom’s rival is the DJI Mavic 2 Pro. The only noticeable difference between the two is their cameras. The Pro doesn’t zoom but has the ultimate optics for an aerial drone. Its camera is a Hasselblad. It sports a 20MP 1-inch CMOS sensor and has an adjustable f/2.8–f/11 aperture. 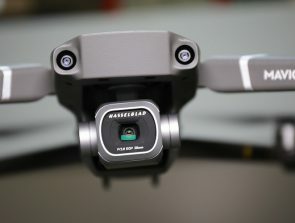 The Mavic 2 Zoom doesn’t have a Hasselblad. It’s an incredible zoom camera, but it’s not on par—quality wise—with the Mavic Pro’s Hasselblad. And the high price tag is sure to put off many outdoor camera drone enthusiasts. The cost of spare batteries is another of the Zoom’s downsides. Drone racing—quadcopters in particular—is one of the fastest growing sports right now. The Hubsan H123D X4 Jet is an excellent first-time racer for the novice. The Hubsan H123D X4 Jet uses powerful brushless motors. It can reach top speeds of around 56 mph (25 m/s). First Person View (FPV) is at the heart of all drone racing. Well, this puppy sports 5.8G real-time FPV transmission. Its feed goes directly to an integrated LCD screen on the remote controller (RC). The built-in camera is a 720P HD model with an adjustable angle of 8–45-degrees. Hubsan’s H123D X4 Jet has a maximum flight time of just 10 minutes. That doesn’t sound much, but it’s on the high side of average for a racing quad. The 100-meter maximum flight distance is ideal for novice racers. An Acro (acrobatic) mode supports fancy aerial stunts like rolls and 360° flips. And a low-power return function stops flyaways by bringing the bird safely back to base. 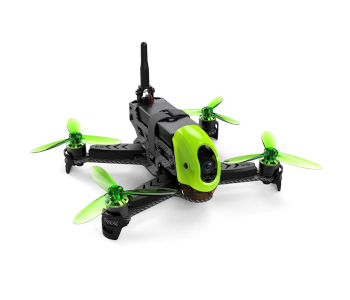 It’s a cracking little quad for racing, a beginner craft for aerial photography, or both. The footage from the 720P HD camera is mediocre at best. It’s quite viewable as a racing feed, but any saved video and photos won’t win any quality awards. That said, it’s a great trainer for those who want to dip their toe into drone racing and aerial photography. The 100-minute charging time is long enough to make uses factor an extra battery or two into the cost. The Altair Tomahawk is another outdoor camera drone that’s ideal for beginners. The makers have exaggerated some of its characteristics. Despite that, it’s still an excellent value quadcopter. This capable outdoor quadcopter is ready to fly (RTF) right out of its box. You don’t even need a WiFi connection or smartphone to get this puppy airborne. That already gets it off to a favorable start. Families love the Tomahawk because it looks fantastic, is straightforward to fly, and easy on the wallet. It also has enough features to please advanced users as well as those at the entry level. Altair’s Tomahawk can stand up to a few moderate crashes and collisions too. That’s always good news for learner pilots. Its high landing gear gives plenty of clearance and safer landing opportunities. Altitude hold is another welcome feature. Each propeller has a flexible guard to shield it from fingers and protect it from damage. The powerful brushless motors are also worth a mention. Brushless motors are quieter, more reliable, and last longer than the brushed alternatives. The drone’s flight time is 17 minutes. That’s impressive for a quad in this category, as is its 900 ft. (300m) control range. A 720p action camera isn’t going to impress anyone. It’s still fit for purpose and provides a viewable live video feed. There’s no stabilizing gimbal either. However, the drone has a 6-axis gyroscope that helps to keep it steady in the air. Best of all, though, is that you can attach a higher quality GoPro camera. A detachable camera option is not something most drones offer at this or any level. There’s not much to fault considering the Altair Tomahawk’s features. Its most significant setback is not with the drone or the mediocre stock camera. The main negative is the extended charging time. Five hours is long by any standards and forces new users to invest in extra flight batteries. The Contixo F18 RC is an outdoor capable quad with a better-quality camera than the last two picks. It’s a nice kit that comes with an intuitive remote controller (RC) and a smart carry case. A 6-axis gyroscope helps to steady the drone in the air and makes it easier to control. Its powerful, high-efficiency brushless motors can keep it flying for up to 20 minutes. The superior motors are reasonably quiet and need no maintenance. They also last longer than their brushed counterparts. All drones can benefit from a return to home (RTH) feature, but they don’t all have it. The F18 does, and it brings the quad back to you if its battery gets low, or if the signal becomes weak. Users can also call the drone back at any time using the one-key return. Contixo’s F18 has a GPS mode so that the craft always knows its location to the controller. These things combined give pilots full control. 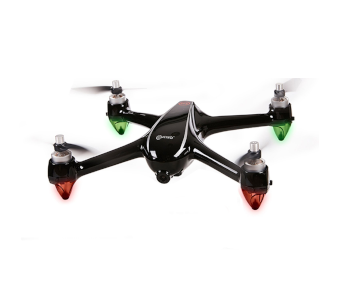 Other noteworthy features include a headless mode, altitude hold, automatic hovering, and bright LEDs. The LEDs are at the front and rear to allow for night flying. The built-in camera has a 1080p HD resolution. Users can view live video broadcasts on the screen of a regular smartphone using the free flight app. That means a bird’s eye, First Person View (FPV) from the virtual pilot’s seat. 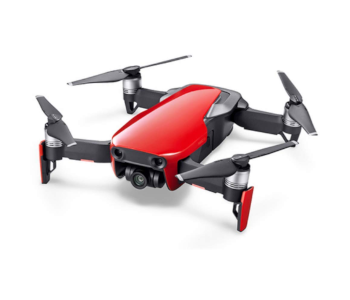 The 4-hour charging time is the main con with this camera quadcopter. Extra batteries cost around 30 dollars at the time of writing, which is a significant added cost. The camera doesn’t have gimbal stabilization. That means some footage is sure to be shaky, especially during turns and in winds. The final gripe is that some users—in certain areas—experience spotty WiFi connections. The DJI Mavic Air is a favorite outdoor drone for people on the go. The reasons are many. The favored ones are its small size, foldable design, and quality gimbal camera. 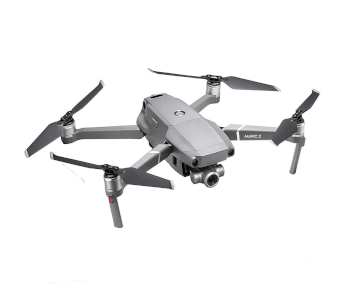 People choose the Mavic Air because of its lightweight, quality, decent range, and portability. Even the dedicated controller folds away to make the setup as compact as possible. You can also leave the remote at home and fly this beauty with hand gestures for close by shoots. Or, you can operate it via smartphone if you prefer. The point is there are different ways to fly and film with the Mavic Air. An effective 3-axis gimbal stabilizes the 12MP 4K camera even at higher speeds. The result is tack-sharp aerial photos and silky smooth video. The quad comes with a handy 8GB of internal storage. Editing and sharing footage to social media is quick and easy thanks to the DJI GO editor. DJI’s Mavic Air also has active tracking that can follow you or other moving objects. The maximum flight time is a lot better than some drones but falls short on others. The 21-minutes wouldn’t be so bad if it weren’t for the high cost of Intelligent Flight Batteries. The phone grip on the remote controller is on the small side. It’s fiddly and it doesn’t accommodate larger smartphones. Last on the list is the Autel Robotics EVO outdoor drone. It’s another foldable, highly portable quality camera quadcopter. This bird can shoot ultra-HD 4K video at 60fps (frames per second). The EVO camera quadcopter is quite pricey but excellent value. Failsafe and user-friendly features are welcome with any drone, but especially higher end models. Well, the EVO has dual GPS/GLONASS satellite positioning vision systems. Pilots benefit from smooth hand’s free hovering and built-in safety like low-battery or lost signal return to home (RTF). Auto takeoff and landing are two more. Those serious about striking aerial footage may want to add the EVO to their shortlist. It’s another travel-friendly, user-friendly, outdoor filming copter. Autel Robotics says it records cleaner, smoother, and faster than its nearest rivals in the portable drone category. It’s still new on the scene—at the time of writing—so only time will tell if they’re right. So far, though, it enjoys plenty of favorable feedback. Live HD First Person View is possible using the free Austell Explorer App. The live stream shows on the remote controller’s (RC) integrated 3.3” OLED display. The RC has an intuitive design with one-touch buttons. They perform various actions and can control the drone as far away as 4.3 miles (6.9km). At around $1000 (at the time of writing this review) the EVO’s not cheap. It’s excellent value, but the price tag is sure to put off a lot of fans. Another gripe is the annoying memory card door that seems reluctant to open. A fiddly door may be minor on the scope of things, but it’s still irritating. What are Drone Flight Schools and Should I Enroll in One?